Trade Twitter CFDs, other major shares, indices, forex, commodities and cryptocurrencies through Capital.com’s award-winning platform. No commission. FCA and CySEC regulated. Up to 1:200 leverage (professionals only). Available on web and mobile. AI technology. Twitter stock trading occurs on the NASDAQ stock exchange between the hours of 09:30 and 16:00 (EST). An individual has two options when commencing in Twitter stock trading. Firstly, they can buy shares in companies on the exchanges where they are listed. For instance, you can buy Twitter stock on the New York Stock Exchange, so you actually own a share in the company. This can be considered a long-term investment, as the individual is usually waiting for the price to rise over time. Another way to invest in twitter stocks is to trade a contract for difference (CFD) on a particular stock, and speculate on the price difference of the underlying asset, without actually owning it. A CFD is a financial instrument - typically an agreement between a broker and an investor, where one party agrees to pay the other the difference in the value of a security, between the opening and closing of the trade. You can either hold a long position (speculating that the price will rise) or a short position (speculating that the price will fall). This is considered a short-term investment or trade, as CFDs tend to be used within shorter timeframes, and is an alternative to trading Twitter shares. Trading on margin: Providing trading on margin (up to 5:1 for individual equities), Capital.com gives you access to trading Twitter shares with the help of CFDs. Trading the difference: When trading a Twitter CFD, you don’t buy the underlying asset itself, meaning you are not tied to it. You only speculate on the rise or fall of the Twitter stock price. CFD trading is nothing different from traditional trading in terms of strategies. A CFD investor can go short or long, set stop and limit losses and apply trading scenarios that align with their objectives. Twitter started as an idea that founder and CEO Jack Dorsey first conceived in 2006, as a side-project to his work. It was originally supposed to be an SMS-based communications platform, where groups of people could stay up to date with each other based on status updates, like open texting. Dorsey proposed this idea to the company he was working for at the time, and he received permission to develop the project further within work. The 2007 South By Southwest conference saw a three-fold expansion of Twitter usage, where more than 60,000 tweets were sent on the day of the event, and this was the start of Twitter’s rise to fame. Twitter had its Initial Public Offering (IPO) in November 2013, where the stock was offered at $26 and closed more than 72% higher that day at $44.90, with an intraday high of $50.09. Co-founder, and then CEO of Twitter, Evan Williams launched ‘Medium’, an online publishing platform encouraging people to write documents longer than Twitter’s then 140-character (now 280-character) maximum. Twitter’s biggest competitor, without a doubt, is the social network giant Facebook. With over 2 billion monthly users and being one of the biggest companies in the world in terms of market capitalisation, it is the social network success that all others try to emulate. Snapchat, although a multimedia mobile application as opposed to a social network, remains a key competitor to Twitter. Snapchat is slowly gaining on companies such as Facebook and Twitter, with 166 million daily active users. Instagram, a subsidiary of Facebook - since it was acquired in 2012 - is a desktop and mobile based network that revolves around sharing pictures and videos. Instagram has gained popularity since its launch in 2010, and as of mid-2017, the service has over 700 million users, making it a worthy competitor for Twitter. Is Twitter a constituent of any popular indices? Twitter is a constituent of the S&P 500 index. What factors affect the Twitter (TWTR) share price? As with any equity, quarterly earnings announcements, as well as the financial performance of the wider stock market are two crucial factors to watch when looking at Twitter stock analysis. Something more specific to Twitter that affects its performance is its monthly active users figure. Monthly active users are a key indicator for traders to watch, because it is a leading indicator of Twitter’s growth. 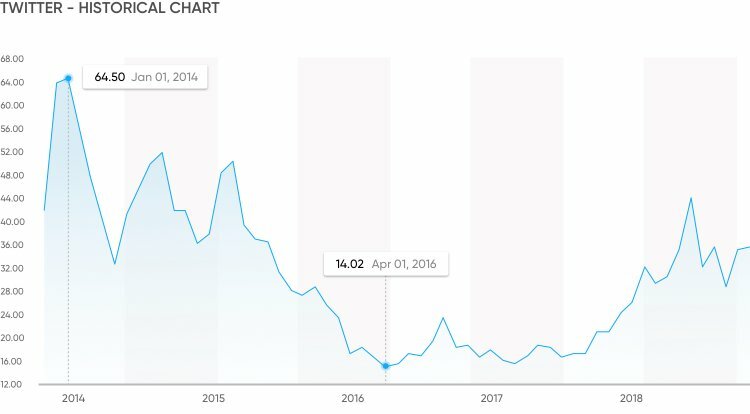 The number of additional monthly active users has the power to send the stock price rallying, if it has largely increased, or diving, if it is declining. Other factors include: outperformance; if Twitter outperforms the broader social media sector in the markets, as well as Twitter earnings surprises when it announces its quarterly results - these all affect the Twitter price.